What do forests mean to you? It’s a question that is being asked a lot during the Forestry Commission’s centenary year. And it’s one that receives a variety of replies. Our forests are gloriously multi-purpose, benefitting people and nature while providing a crucial natural resource and playing a vital role in rural economies. At the same time, our woodlands are under pressure. The threats posed by climate change, invasive species, pests and diseases are all too real, and could have devastating impacts on our landscapes. Founded in 1919, the Forestry Commission has more than doubled Britain’s forest cover over the past 100 years. The Commission works with a host of wildlife organisations to help threatened species, and plants a diverse range of broadleaf and conifer trees to create resilient forests for the future. Recent years have witnessed a spike in leisure and tourism, with the development of new walking and mountain biking trails, live music events, cabin stays and wildlife walks. 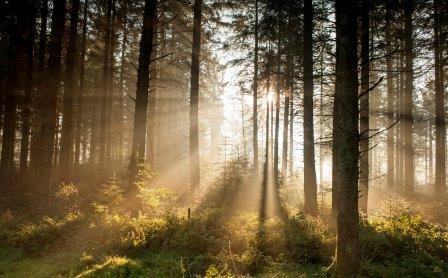 The Forestry Commission is marking its centenary by inspiring people to connect with trees and woodlands, to help protect them for generations to come. Activities include the Big Forest Find, the largest ever survey of forest wildlife, a creative film about sustainable timber production, and new works by sculptor Rachel Whiteread and poet laureate Carol Ann Duffy. While it is celebrating its centenary this year by telling stories from the past, it has one eye firmly on the future, and the next 100 years of forestry.